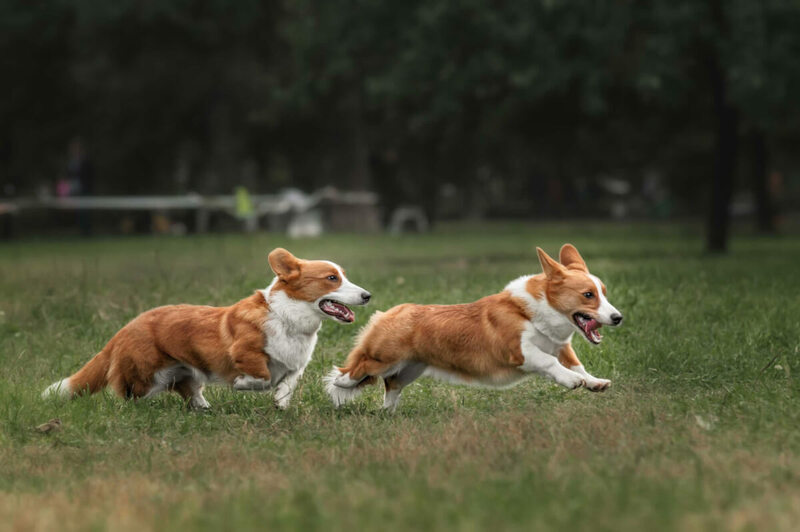 There are two separate breeds of Corgis which are very similar in appearance, the Cardigan Welsh Corgi and the Pembroke Welsh Corgi. The two breeds close resemblance is due to crossbreeding between the Cardigan and Pembroke in the early 1900's. 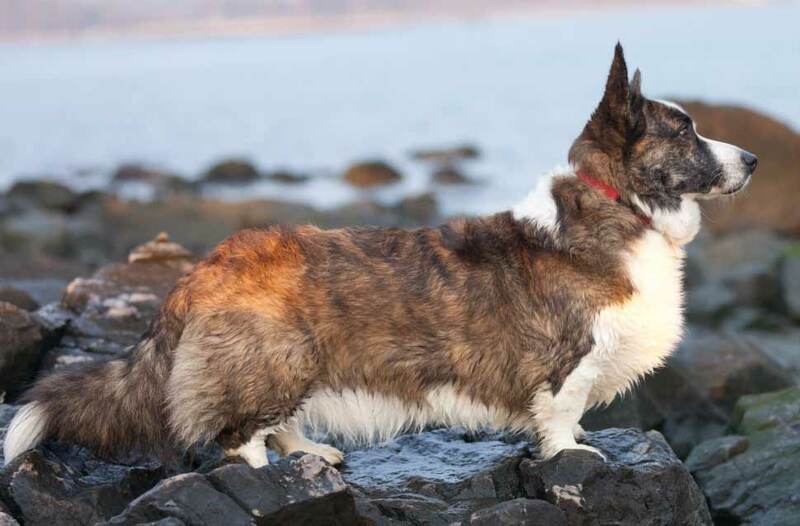 Today the most obvious difference between the two breeds is the Pembroke's lack of a tail (whereas the Cardigan Welsh Corgi has a tail). 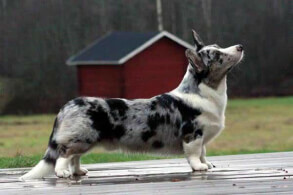 The Cardigan Welsh Corgi is a medium sized dog breed which was originally bred in Wales for herding purposes. As with most herding breeds, the Cardigan is highly intelligent and hardworking making them very receptive to training. Below are the details and specs on the Cardigan Welsh Corgi dog breed. 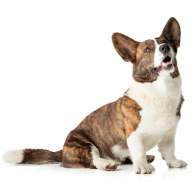 The Cardigan Welsh Corgi is a medium-sized dog that with a length of 10 to 13 inches and a weight that can reach 30 pounds. 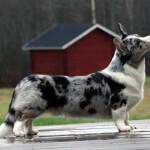 It is a short dog, with legs much shorter than the rest of its body counterparts. The Cardigan Corgi is slightly larger and heavier-built than the Pembroke Corgi. The Corgi is a medium-energy dog, and is a herding dog. 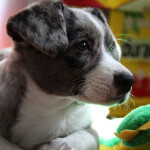 It is very trainable, and when well-socialized, can get along great with kids, families, and other pets. It is a fearless and independent working dog, with excellent herding skills and an intelligence that is very receptive to training. When bored, the Corgi is capable of finding itself different tasks to keep busy. 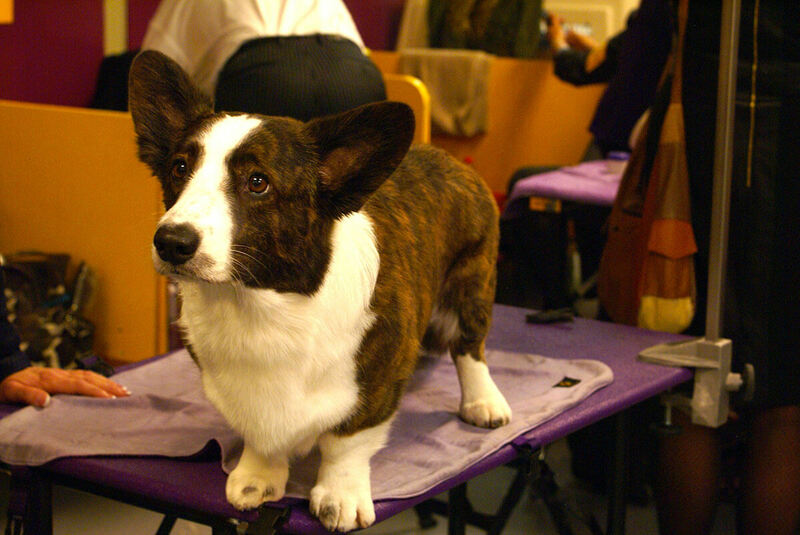 The Corgi is a medium maintenance dog. Because it sheds frequently, the Corgi needs frequent brushing care to contain its shedding. 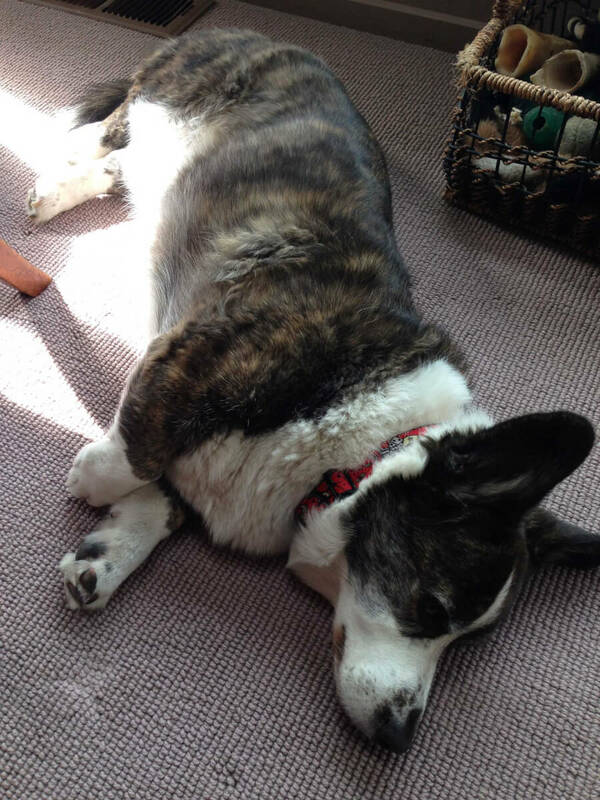 With its medium to high energy, the Corgi requires vital exercise and a well-monitored diet, as excess weight can lead to various health issues. The Cardigan Welsh Corgi is the older of the two breeds, and is one of the earliest breeds in the British Isles. It was recognized by the AKC in 1935. It is believed to have been in existence in Wales for more than 3000 years. It is a transitional for between the Teckel and Spitz family. Its original work was to clear the way for its master's herd, and it did so by chasing off predators and trespassing herds. The Cardigan was later used as a herder or "drover," driving cattle to different English markets. It ancestry traces back to the Dachshund. The Corgi is low-set and sturdily built, with legs much shorter than average when compared to the rest of its body. It has erect ears and a foxy head. It is double-coated, with a thick undercoat and a longer top coat. 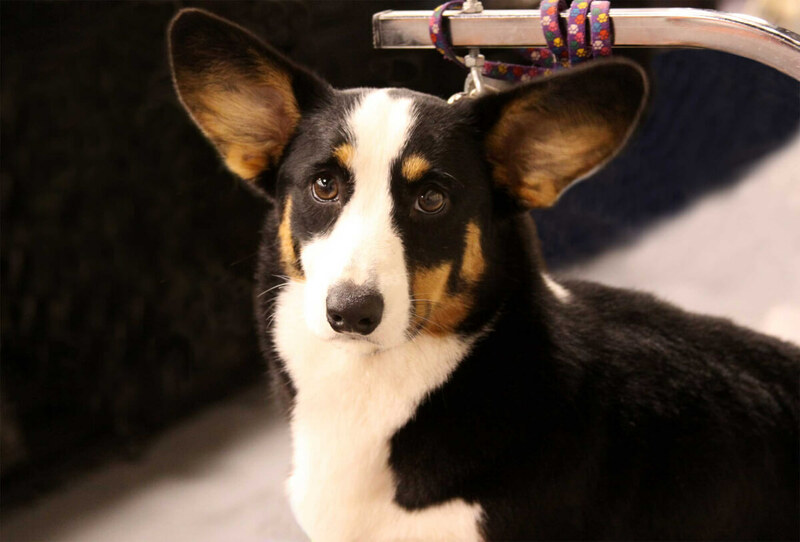 The Cardigan Welsh Corgi has ears which are rounded at the tip and feet which point slightly outward (no more than 30 degrees). The Cardigan is slightly larger and more heavily boned than its Pembroke cousin. 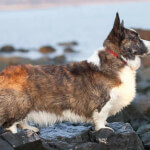 The most obvious difference between the two Corgi breeds is the Cardigan has a full length tail, whereas the Pembroke's tail is naturally docked. The easiest way to remember this is that the Pembroke has a "broke" tail, whole the Cardigan's tail is long like that of an actual cardigan. The Cardigan Corgi comes in the following colors: brindle, brindle merle, blue merle, red, red merle, sable, sable merle, and black. All of the colors are mixed with white trim. Both the Pembroke and Cardigan Welsh Corgi are close to the same size (with the Cardigan being slightly bigger on average). You can expect the Cardigan to stand 10-13 inches tall and weigh up to 30 pounds. The Cardigan Corgi is described as devoted, alert, companionable, active, intelligent, and affectionate. 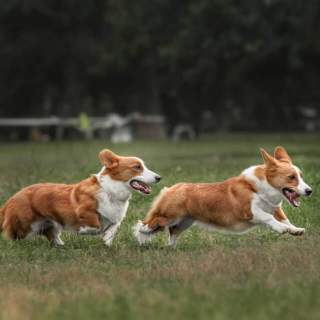 Herding, obedience, agility, or chasing balls are all enjoyable outlets for the Corgi's strong desire to work. The breed's high intelligence makes the Cardigan very trainable. 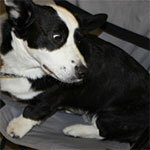 The breed is an independent thinking and problem-solving dog, which is common in herding dogs. This means the breed can make decisions based on their own judgement instead of following a specific command, so it is important for owners to be confident and consistent in their training or the Cardigan will bend the rules or make up its own. The breed has a strong desire to work and will be looking for a task to complete. A steady training regime should keep the Cardigans boredom at bay, however Cardigans with a lack of mental exercise will find a way to entertain themselves which can lead to unwanted behavior and undesirable habits. The Cardigan Welsh Corgi does well with children. Their small size makes it difficult for them to unintentionally knock over smaller kids and their high energy will likely tire out some of the most energetic children. It is best to introduce the Cardigan to small children as a puppy so the breed will be familiar with kids as an adult. As a herding dog there is a risk of the Cardigan attempting to herd groups of children into a pack by nipping at their heels, so they should be supervised when playing with kids. The Cardigan does well with other pets and animals. 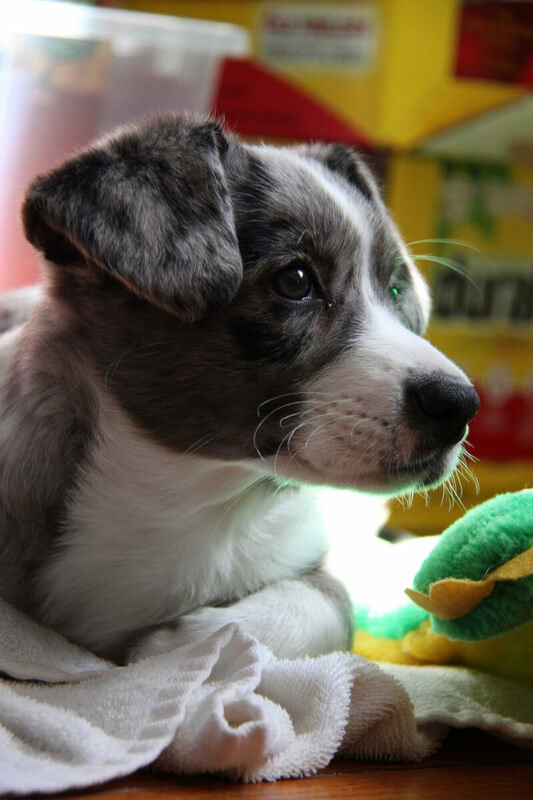 They do best when introduced to other pets as a puppy, so it is recommended to socialize them at a young age to help improve its behavior around other animals as an adult. The Corgi is wary of strangers, and needs to proper socialization training at a young age (while still a puppy). It is comfortable with other humans so long as it sees the humans above them in the pack. 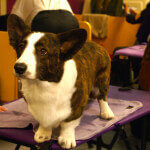 Below are pictures of the Cardigan Welsh Corgi dog breed. 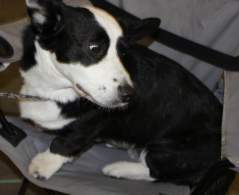 The Cardigan is a medium maintenance dog breed. Their coat sheds frequently so it will need to be bathed as needed and brushed regularly. The breed is medium to high energy so they will need daily exercise and a regular training regime to keep the dog both mentally and physically exercised. Corgis shed regularly and will blow their coat (shed heavily) twice each year. It is recommended to brush their coats regularly to keep shedding at a minimum. The Cardigan will need daily walks an adequate play time to burn off their energy. The breed is fast and agile, but somewhat fragile when it comes to jumping of ledges, stairs, and furniture (due to their short legs and long torso). Because of this you shouldn't encourage them to take routes which require jumping over or down obstacles. The Cardigan is suited for both apartment and country life. The breed can call anywhere home as long as they are properly exercised. The Corgi prefers temperatures between 50-80 degrees fahrenheit. If the breed is going to be inactive in temperatures colder than 50 degrees they need to be supplied with a shelter to protect them from the cold.